Whether you have ever collected toy soldiers or not I'm sure all of you reading this, at one time or another, have come across the name William Britain. William Britain, Britains, W.Britain and Petite are just four of the names the oldest and most well-known UK toy company has been known as over the years. The exact moment when William Britain Senior turned his hand from 'Brass Clock Maker,' his original trade, to toy maker is unknown. However what is catalogued is the start of toy soldier production, the business which made W. Britain a household name during the 20th Century. From 1966 until the early 1980s, Britains continued to be a toy company focusing on space and agricultural toys as well as plastic military figures. In 1983, Britains launched its first all metal figure in nearly 20 years, and although in 1973 it had introduced a diecast metal Scots Guard figure set, these still featured plastic weapons so couldn't be called true metal models. The 1983 sets were harking back to Britains past, and although no official evidence exists, it appears the range was possibly designed to capitalise on the growing nostalgia market in the early 80s, as well as the established tourist trade in and around London. These first few sets featured typical ceremonial subjects such as Life Guards, Camerons, Black Watch and Yeomen and proved popular enough that by 1984 the 'Metal Models' range had begun to grow. The next big change to take place was also during 1984 when the first sale of the Britains company took place. As Dennis Britain wished to retire, and no other family shareholder wished to take over the company, it was sold to a small Midlands-based conglomerate, The Dobson Park Group, who in 1986 changed the company name to Britain Petite Ltd.
Metal Models' continued to appear in the main Britains catalogue during the 1980s until 1987 when it was finally decided that these lines were collectibles rather than toys and as such were given their own special four page catalogue. During the late 80s the popularity of these new metal toy soldiers continued to grow with collectors the world over, until finally in 1993, the W. Britain Centenary, the W.Britain Collectors Club was launched. The Club still continues to this day and has thousands of members scattered around the globe. Yearly membership to this exclusive club includes four club magazines per year (quarterly), catalogues, special vouchers, and a choice of exclusive Club figure as well as regular updates on everything to do with W.Britain toy soldiers. The Dobson Park Group remained in control of W. Britain until its acquisition by US toy company Ertl in 1997. Ertl bought W. Britain primarily for the farm series, not the toy soldier business, as Ertl was already an established manufacturer of farm toys in the USA and thought the Britains farm lines would be a good addition to its company. Ertl however did nothold on to W.Britain for very long as in 1999 the entire Ertl company, including W. Britain, was bought out by an even larger US toy company Racing Champions. During Ertl's ownership it had moved most of the W.Britain production to the Far East, not to reduce costs but simply to improve quality (something Britains had already done years before with the Deetail range of figures), Racing Champions continued with this plan and finally in 2001 moved all remaining toy soldier production from the UK to the Far East. Under the Racing Champions company W.Britain continued to grow, especially the newer style matte/connoisseur painted action figure ranges Ertl had begun to introduce in the late 90s, these figures were a distinct change to the traditional gloss figures Britains had produced for over 100 years. As Racing Champions continued to grow as a toy company it wasn't long before the decision makers realised that the W. Britain toy soldiers were a very small part of their overall business especially considering it required an inordinate amount of time and effort. So in mid 2005, when a small US collectible diecast vehicle manufacturer First Gear approached Racing Champions about acquiring the W. Britain name and toy soldier ranges, they accepted. In early September 2005 First Gear acquired W.Britain toy soldiers. The brand now seems to have gone full circle, as what was once started as a small family business is now once again owned by a small family business, the only difference being now the family is American not English. First Gear has a reputation for making some of the most detailed die cast replicas vehicles in the market today. This same attention to detail, quality and authenticity has been applied vigorously to the W.Britain range. 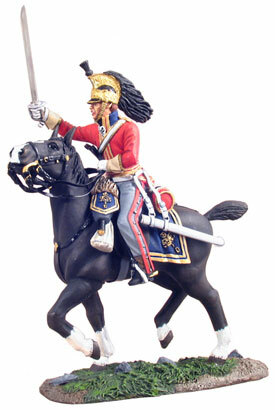 In 2006, W.Britain under First Gear, launched half a dozen new ranges with greatly improved sculpting and painting detail, a renewed commitment to the finest quality — from the figures to the packaging and customer service, and authentic, historically accurate figures researched in partnership with world renowned military museums and sculpted by military historians. If you have never collected toy soldiers before, now is a great time to start and join the thousands of collectors around the world who love the figures this 114 year old company are still producing! On February 5th, 2016 the 123-year-old brand was sold to The Good Soldier LLC, located in Holland, Ohio. This new company is owned and operated by toy and model figure collectors dedicated to continuing our commitment to quality and authenticity. All new product development will remain consistent to the style, size and scales established in the last ten years because the entire creative team has remained intact with the new ownership. For additional history information, please read these articles from the Old Toy Soldier newsletter.